Under-sink kitchen fluoride water filter, known at the Fluoride Chlorine Plus. This is an under-sink kitchen fluoride water filter, the 2 Canister Fluoride Chlorine Plus. This – and ALL of these kitchen canister filters work on over 600 contaminants. Select which is best for you by which disinfectant is used – chlorine or chloramine – and whether your municipality adds fluoride. Other considerations for extra filtration include nitrates and arsenic. To add those, select a 3-canister unit. 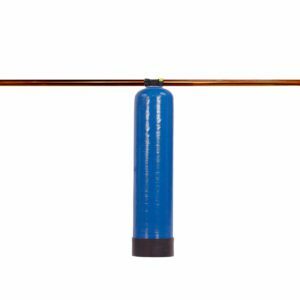 These water filters have the additional advantage of a patented process that increases contact time between the water and the kdf. This means MORE FILTRATION! This kitchen fluoride water filter is designed for municipally-treated chlorinated and fluoridated water. If you don’t know whether your community uses fluoride, or if they are using chlorine or chloramines, either look up the Annual Water Quality Report online for your community, call the number on your water bill, or email us to check for you. This item is not the right filter if your municipality uses chloramine. The improved under sink canister housing handles 33.3% more pressure than the industry-standard white housings. Please note that the new improved housings were introduced after this video was made. Your kitchen fluoride water filter system will look like the still photo. WHAT IS FILTERED by the KITCHEN FLUORIDE WATER FILTER? The FDA has certified all the filter media in this filter. This kitchen fluoride water filter has been tested and approved to NSF/ANSI 53 standards for fluoride removal by the Water Quality Association. The idea is that they work on all the categories of contaminants. To see a larger sample list of contaminants filtered, see What is Filtered? The short answer is that they work great! The types of filtration include ‘pore opening’, magnetics, catalytic action using reduction-oxidation, electroplating, ion exchange, and reshaping of hardness ions and adsorption. An environment harmful to bacteria, algae and fungus is created. The water acts softer. Trace elements the body needs stay in the water! The water that comes out is pure and healthy. Water flow is excellent. This filter has nothing to do with reverse osmosis. We don’t sell R/O because we don’t find them a good solution. 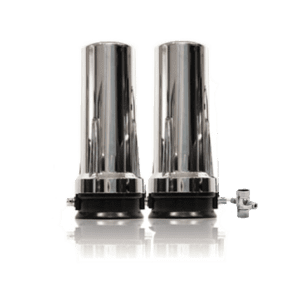 Unlike reverse osmosis filters, these filters do not strip your water of the trace elements the body needs, you don’t have to store water in a small tank, and you don’t waste up to 70% of the water by throwing it and contaminants back into the environment! More info on Reverse Osmosis. Note: TDS (Total Dissolved Solids) is a measure used for Reverse Osmosis filters. You do NOT want low TDS. If you have low TDS that means that you are not getting the trace elements and minerals that the body needs like chloride, calcium, magnesium and zinc. The fixtures are the highest quality, and there is more of the right filter material – resulting in greater and longer-lasting filtration. And because the kdf uses the FOAM ADVANTAGE, there is more room in the canister for other media, further increasing filtration. * A standard faucet is included in the price. Open the pictures above to see the chrome and brushed nickel upgrades. We recommend a faucet upgrade. They look and work better, and last longer. * Choose activated alumina or calcium-based carbon to filter fluoride. This is a personal preference issue; they both work about the same. 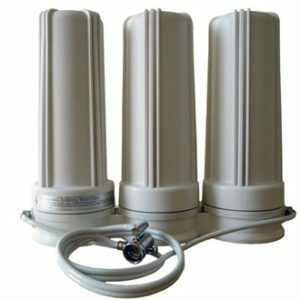 * The standard wide-spectrum cartridge filter hundreds of metal, chemical, and organic contaminants, and on taste and odor issues. The 1 micron “plus microfiber” version does all of that as well as filter cysts like cryptosporidium and plastic microfibers. For certifications + test results, please Start Here. Learn more about why you want to Remove Fluoride. And go to the Education tab above and open Water Filters for lots of info. Please have this filter installed by a plumber or someone who understands plumbing. It is a quick and easy job for a professional, taking about a half hour. “Just wanted to pay a huge compliment to your fine products. I have an undercounter fluoride water filter. I can not say enough great things about the quality of the water! I L-O-V-E it and am sooooo pleased with this purchase!
. . . . . With Sincerest Appreciation – Hope H.
“I’m really surprised at the great taste of the filtered water as compared to bottled water. To think LA water could taste this good is amazing! The water coming out of the filter I got from you has a good natural earth kind of taste. It’s like I were out in the wilderness – almost a tropical taste. Even the drinks I mix with this water taste better. I make an herbal drink with whole lemon; it even looks brighter than when I used bottled water!
. . . . . Joseph Z. This kitchen fluoride water filter plus unit contains the following top-quality media. * Sediment Filters – separating the other media. 1 in the first canister, and 2 more in the second. * OPTION: Activated Alumina – a full pound and a half of activated alumina to remove fluoride. THIS IS NOT ALUMINUM. It is a safe and natural inert resin. Activated alumina removes fluoride and does not add aluminum! OR YOU CAN CHOOSE a cartridge for fluoride removal that uses calcium-based carbon, aka bone char. They are equally safe and effective. If you are vegetarian, you may prefer Activated Alumina. * Kdf – 1 1/4 pounds of patent-processed kdf! This puts it in balance with the other media. Especially effective at filtering chemically-based contaminants, heavy metals and chlorine. Kdf is bacteriostatic, preventing bacteria from growing in the carbon or your water. * Granulated Coconut Carbon – a full pound (that’s 453 grams) of top-grade pre-washed granulated coconut carbon! Works especially well against organic-based contaminants. The kdf in this and all the kitchen canister filters has been formulated using a patented process that powderizes and shapes the media into a form that does not compress, and increases the contact time between water and filter material. This is how filtration happens. This means more filtering takes place in a smaller part of the canisters, allowing more of the other media – which means yet more filtration in turn. To learn more, see the Foam Advantage. You do not need a plumber to change cartridges. Change filters by turning the canisters counterclockwise (same as a light bulb). We send you a free wrench to make it easier. No screws, no screwdrivers. Turn the water off. Put new cartridges in the same way as the previous ones were. Do one at a time. * A standard faucet is included in the price. Open the pictures above to see the chrome and brushed nickel upgrades. We recommend a faucet upgrade. They look better, work better, and last longer. * Choose activated alumina or calcium-based carbon to filter fluoride. This is a personal preference issue, as they work about the same. Vegetarians may prefer activated aluminum. * The standard wide-spectrum cartridge filters hundreds of metal, chemical, and organic contaminants, and works on taste and odor issues. The 1 micron “plus microfiber” version does all of that as well as filter cysts like cryptosporidium and plastic microfibers. We have this filter for about 4 years and we are very happy with it. We got it after being unsuccessful with other filters. The water flows very well and the water tastes great. We have to change the fluoride filter every 6 month and the chlorine filter once a year. We are also happy with the shipping services of Friends of the Water, is affordable and quick, considering that we are in Alaksa. When We got the filters, we got Friends of the Water helping us decide what we had to get for our water, they even read our water report to help us choose the right filter. Great costumer service. When we moved to Santa Barbara I obtained a water report from the city to identify the exact type of water filter system that would work best for the water in our area. I took this report to three different companies and none of them could explain what kind of system would be a good fit. The sales people had no idea how to answer the question I proposed. They just wanted to sell me their filter system. Timothy at Friends of Water spent at least an hour with me examining the city water report and identifying which type of filters would work best. Not only did I have an extremely positive customer experience when purchasing our Whole House Water System combined with this Kitchen Fluoride Plus.Filter, it ended up costing much less than any other companies I shopped. From a health perspective we feel safe with our Friends of Water system. We were a family who consumed only Smart Water, now we drink our tap water and it tastes wonderful! Thank you Timothy and The Friends of Water Team. We are very satisfied with the filter for our drinking water. Flow is good and the water tastes great. We wanted to leave the natural mineral content in our drinking water. I have purchased filters from this company for the past 5 years. The customer service is the best! And their filters are the best buy on the market. I highly recommend this filter! The flow is great and the water is clean and crisp. Filtering out fluoride while retaining the beneficial minerals of water is very important. Timothy took a lot of time with me on the phone and explained all of the options. Excellent product and excellent customer service. I won’t go anywhere else for my water filtration needs. I purchased this water filtration system four years ago & couldn’t be happier. The water is delicious without the taste of fluoride, chlorine & other contaminants. I highly recommend this product if you are looking for more healthful, better tasting water. I also heartily agree with everyone else about the excellent customer service Timothy provides. It’s a real pleasure doing business with this company; I plan on continuing to do so well into the future . We purchased this water filtration system just a few months back and love it! The water tastes great and the system doesn’t take up much room under our kitchen sink allowing for additional storage. We would highly recommend Friends of Water to anyone looking for a water filtration system for their home! Timothy was very knowledgeable and very honest and offered excellent customer service. Thank you Friends of Water! I am very pleased and happy with my water filter! My mind is at ease knowing that my family is drinking safe, clean water! No complaints whatsoever! Thank you!! 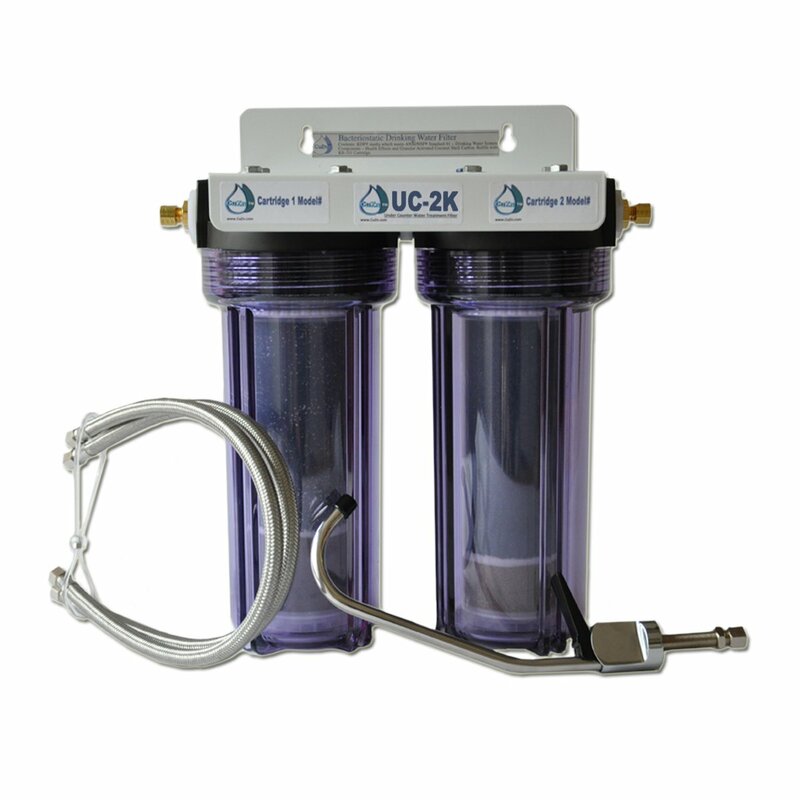 This is an excellent filtration system and easy to install. The flow rate is plenty and we enjoy being able to fill up the tea kettle and other pots/pans quite quickly. We’ve never had water in our house that tasted this good (ok, for a short period of time we had Mountain Valley Spring Water delivered, but it was costing us $100+ per month for the few months we had it – it tasted pretty darn good as well – but we only used it for drinking because of the price)! dry experience replacing my cartridges! thank you – I love your design! In case others ask, I wanted to pass along that although the size and appearance of the FOW canisters are the same as the hardware store under-sink filter I had before, the tightening-wand, the extra long tubing you provided and the self-protection of the filter itself, make the filter-changing experience clean and dry, and it happened right in the kitchen sink! The whole process was self contained with none of the mess of my old unit. I will not dread the experience the next time!